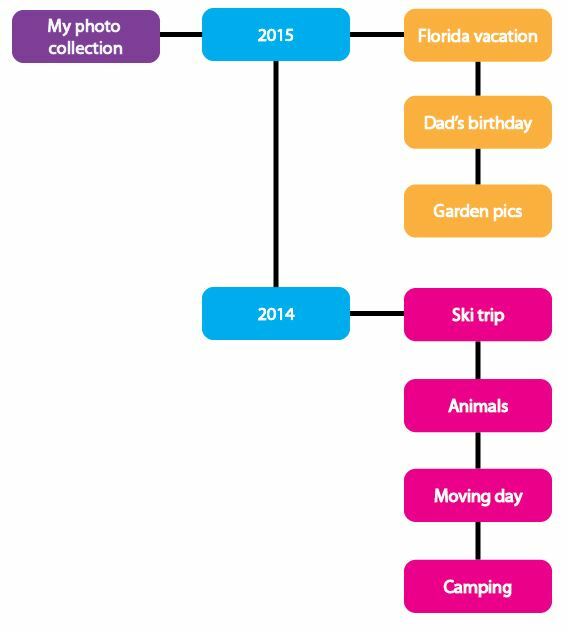 Over the past twenty years with the transition into a digital world, the way we collect, view and capture photographs has changed. Gone are the days when each of our snapshots took a physical form and held value in the time and money it took to create it. With digital technology offering high quality images with the use of a cell phone, and the cost of storing those images continuously decreasing, the decision to make and keep an expansive collection takes little deliberation. For those of us who were around to watch the transition from analogue to digital photography formats, we can still remember the days when that push of a button created a real object that held our memories and could be kept as a souvenir for the years to come. 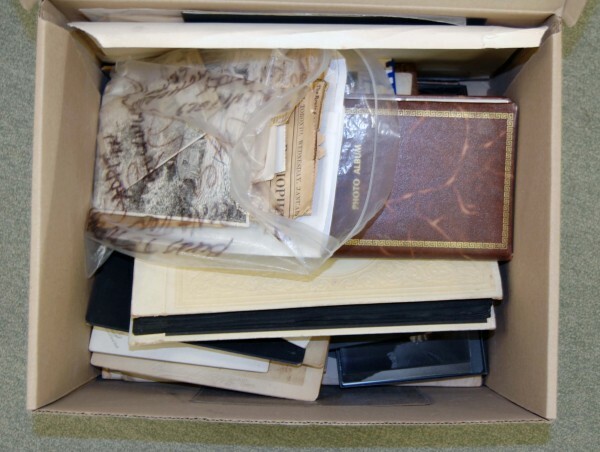 So how do we care for and ensure the longevity of our shoe-boxes and albums of prints combined with our hard drive of digital images? 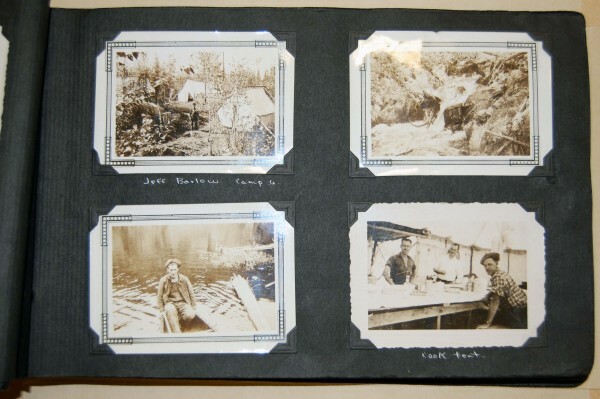 If your photograph collection looks like this, you should probably read this blog post. 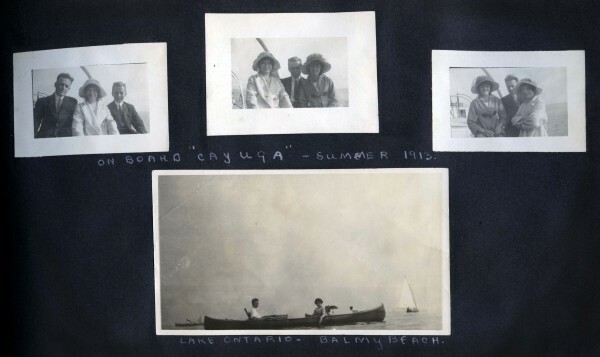 Analogue photographs, whether developed in a drug store or printed in a dark room, are far from permanent. In fact, if your photo collection is anything like mine, the majority of those photographs are probably colour 4×6, Polaroid, or photo paper print. 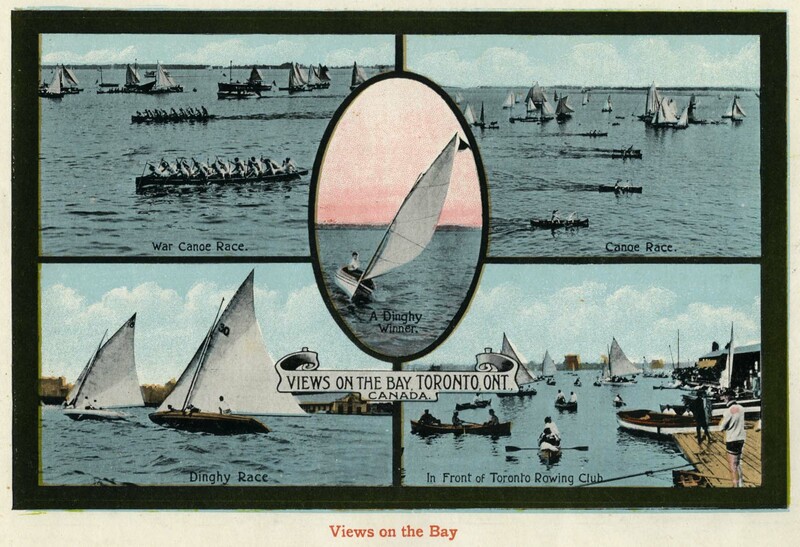 These colour prints are actually at a higher risk of fading than your great grandmother’s old silver gelatin black and white prints. In fact, if you go take a look, they are probably far from the way they looked when you got them already. This is why, if you want those pictures of you as a kid or your wedding day to be around for your grandchildren and great grandchildren, your best option is to re-capture them digitally. Digitization doesn’t have to be expensive, but it can be time consuming. Deciding to digitize is the first step, but depending on time, technical know-how, digital storage capacity and available equipment, executing your digitization plan can take a variety of forms. 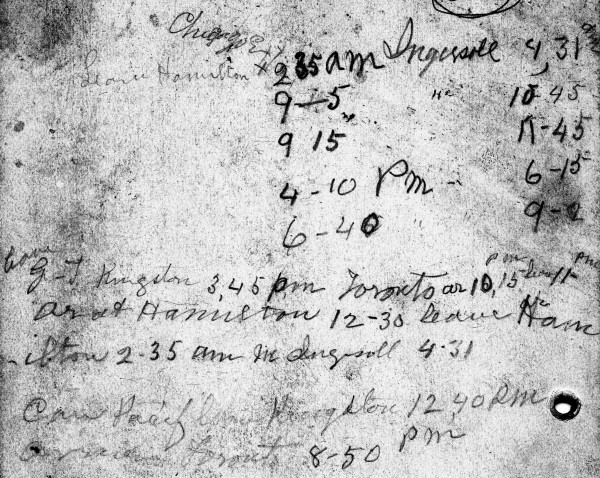 Ideally, for long-term preservation, scanning is the way to go. A good scanner can provide you with high quality images that will allow you to view, print and display your family photos however you choose. 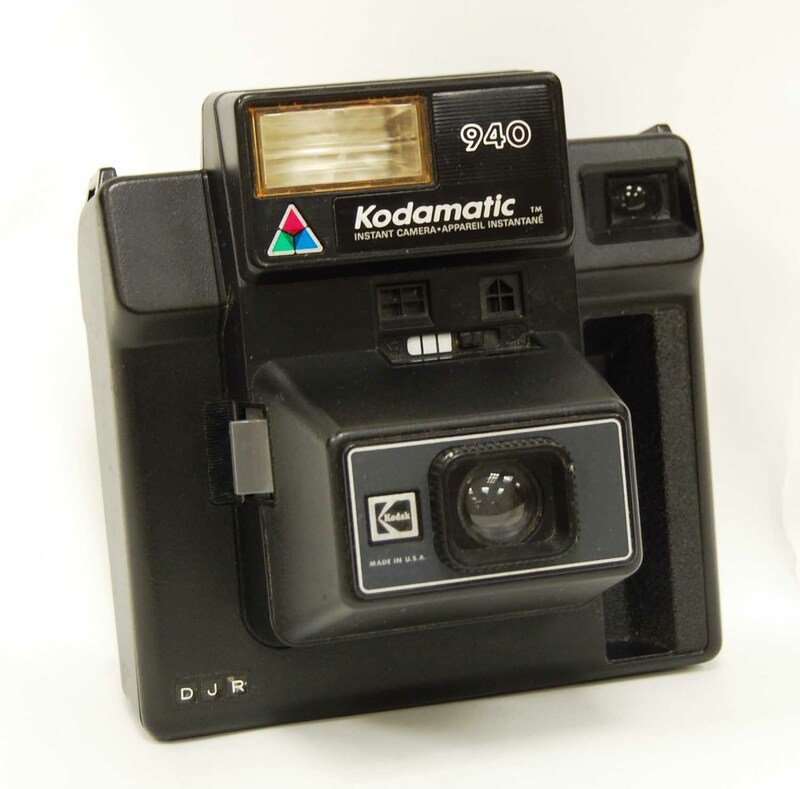 Depending on the type of photographs you have (especially if there are negatives or slides in your collection), you may need a scanner capable of transparency scanning. A good scanner goes up in price pretty quickly, but there are other options. For instance, the Toronto Public Library has Digital Design Workstations equipped with Epson scanners that can be reserved for two hours at a time to help get you through that shoebox or two in your closet. Software such as PhotoShop, EPSON Scan in professional mode, or SilverFast will provide you with all the settings you need and usually come with the purchase of a scanner. Essentially, the settings you will be looking for include things like Document Type, Image Type, Resolution and Image Format. Features such as batch scanning that speed up the process by allowing you to select and scan more than one photograph at a time are also something to look for. Generally, the auto settings of the scanner should work fine, but you will want to ensure a resolution of at least 300 dpi/ppi with 24-bit colour RGB depth and that you are saving in TIFF or JPEG format. 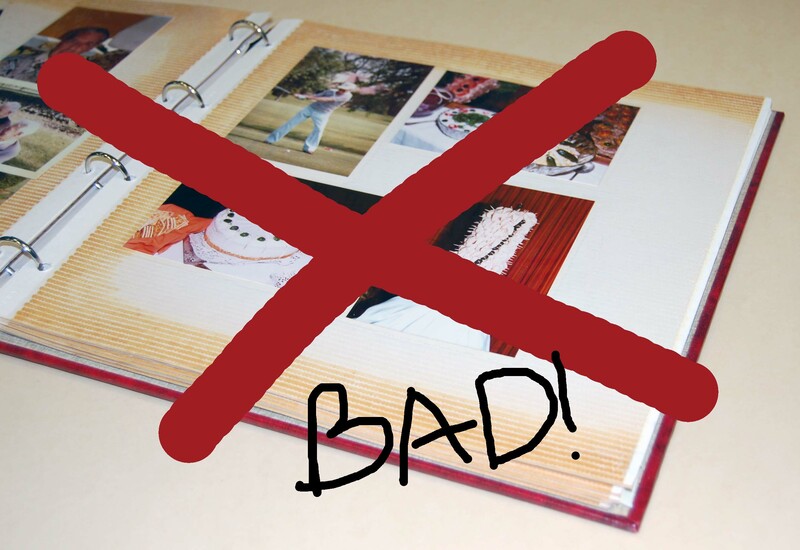 Make sure you are working with a clean scanner and have dusted off your photographs to prevent it from appearing in your digital image and avoid timely editing later on. If you are really concerned about capturing the colours of your photograph as accurately as possible, the FADGI Guidelines for Digitizing Cultural Heritage Materials reviews how to scan a photograph for conservation and long-term preservation, and cover topics such as using a colour reference target, preparing your viewing environment, monitor calibration, spatial and signal resolution, colour gamut, colour mode, colour space. Generally, for heritage preservation the recommended pixel array is 4000 pixels along the longest dimension of your photograph. So if you are scanning a 4 x 6 inch print, your spatial resolution should be set to (4000 ppi ÷ 6” =) 600 dpi/ppi. 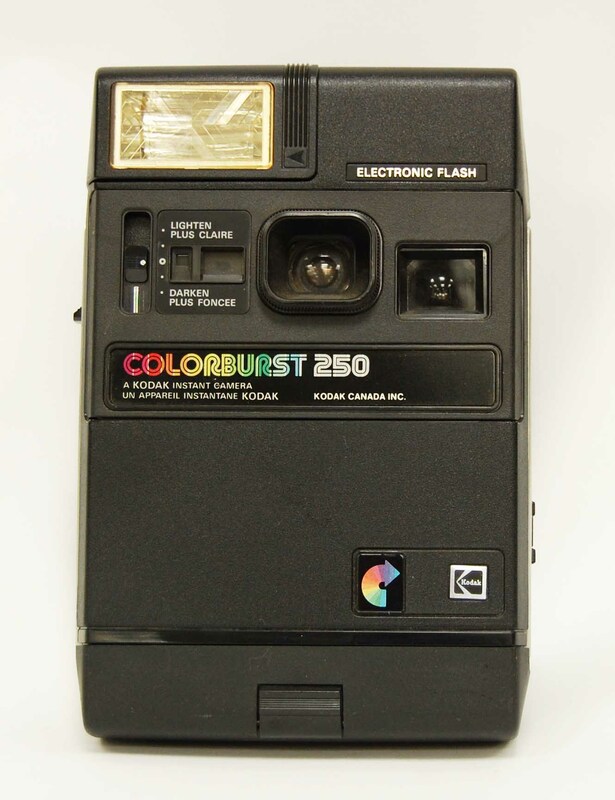 If a scanner is out of your budget, and your local library doesn’t have scanners for public use, you might want to consider the option of re-capturing your photographs in a digital format. This can also be as simple or complex as you decide to make it. 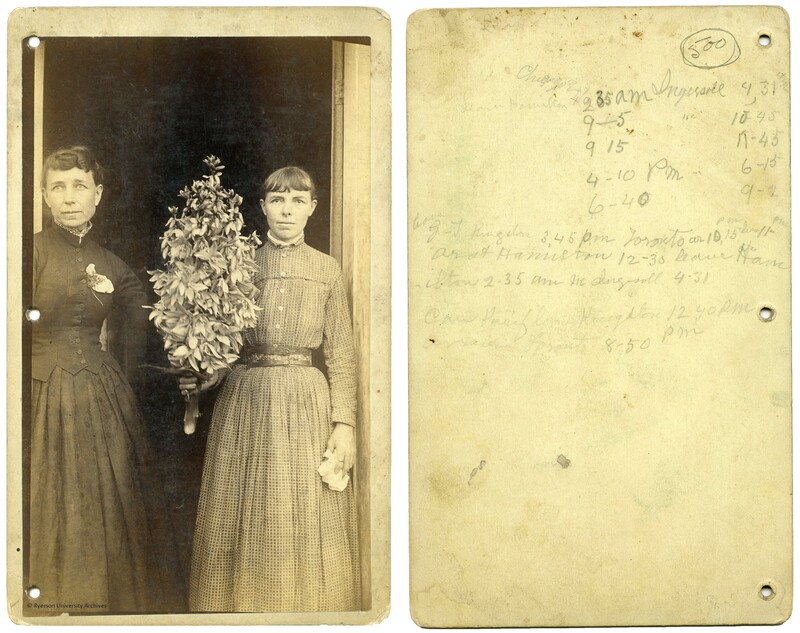 If the size of your original photograph is information you find valuable in its preservation, include a ruler or other measurement scale in your image. 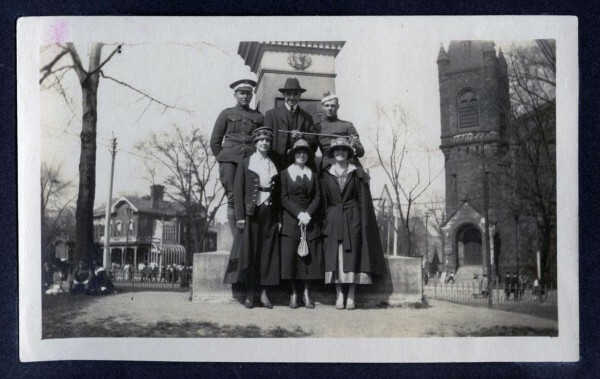 Other information about the photograph, such as geographical location where the image was taken, or the names of its subjects, that you do not want to lose can also be included in the frame of your new image. Place photograph on a solid grey background, use an easel or copystand if available. 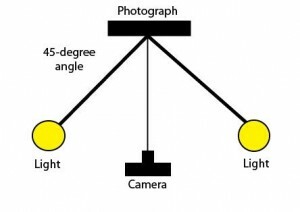 Use a tripod (and a release cord if possible) or other steadying device to prevent blur from occurring in your digital images. Line up the frame of your digital image with the frame of the photograph. Try to ensure each corner of the original photograph appears as a right angle in your viewfinder to prevent distorted imaging. Be aware of light and shadows. Optimally you will want to set up two lights, the same height and distance away and on either side of the photograph to ensure even illumination. Additional light sources can help prevent shadows caused by curling or frames. Diagram depicting the set-up for digitizing a photographic print using a digital camera. Preserving your family photograph collection doesn’t end with digitization. To ensure that your memories don’t get lost in a sea of desktop files or become an obsolete file format, you will need to maintain and follow a system. 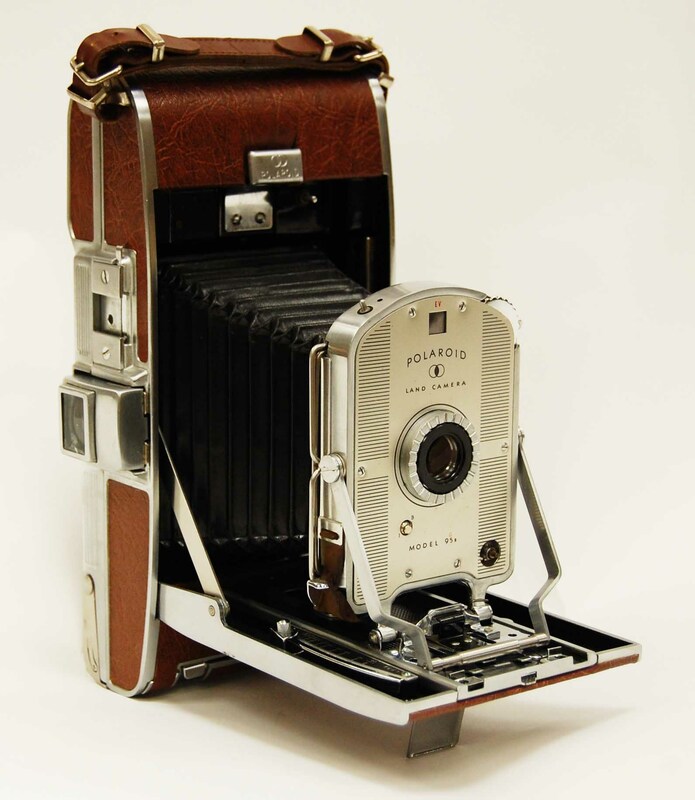 Organization is key in the prolonged care of both physical and digital photography collections. Choose file names that will make your images easy to search so that they won’t be hard to find when you need them, and save in formats that you know you will be able to access in five years (e.g. JPEG, TIFF). Keep a backup (or two!) on a cloud or an external hard drive, so that if something should happen to your computer and your files are destroyed, you will always have another copy. Set a reminder to update your backup weekly, monthly, or yearly depending on how many pictures you’re taking and if possible, store the backup at a different location. A rule of thumb is that generally photographs like to be stored in the same environment that people like to be in. A cool, dark place with about 40% relative humidity is ideal, so it is best to avoid storing your prints in a damp basement or humid attic. Also remove any potentially harmful storage materials, such as glassine, which has been a popular material for photo sleeves. 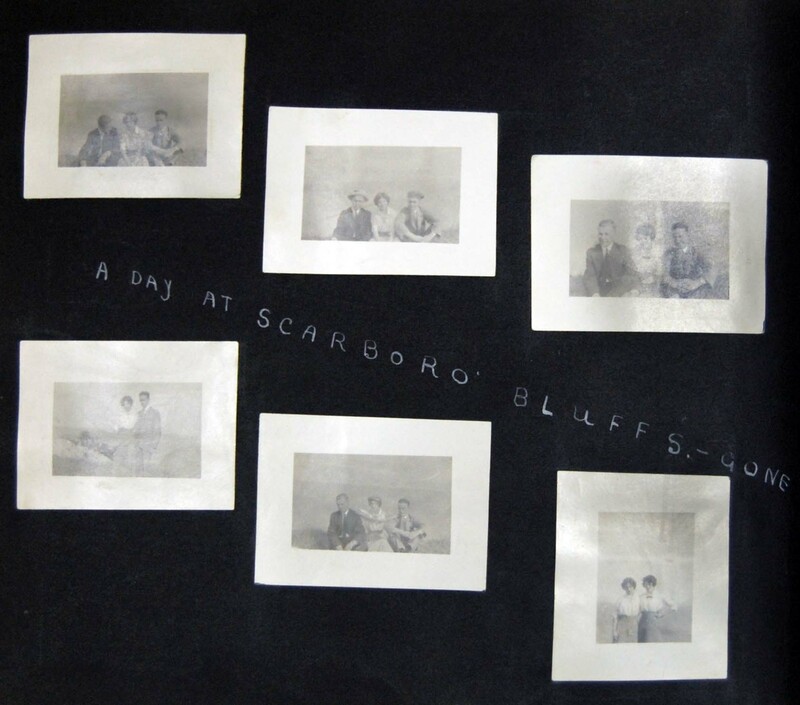 Acid-free paper sleeves are a good option for storing photographs you don’t intend to handle often. If your prints are in a shoebox you’re on the right track, but ideally it is best to store them in a material less acidic than cardboard to ensure they will not be subject to the harmful results of off-gassing. To prevent any warping it is best to lay them flat, and in case there is any adhesive, try to separate each print with Mylar, acid-free paper, or acid-free tissue. House them in individual sleeves, envelopes or enclosures to protect them from handling and changes in the environment. Polyester sleeves will protect your prints while also allowing you to look at them. If you want to store your prints upright, make sure they are kept flat by including a spacer to prevent warping. Use photo-corners to attach prints to the pages. This way, only the corners will touch adhesive, and not your prints. Should someone want to remove the print from the album they will be able to do so with little to no damage to the object. Use acid free paper. This will delay deterioration such as silver mirroring and fading. Separate the prints so they are not stored facing each other. Some albums are sold with acid free tissue in between the pages that will do this for you. 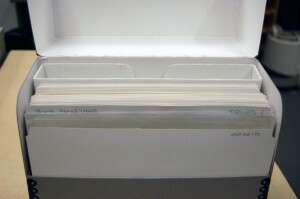 If you are using a binder, you can also do this by inserting each page into a Mylar (Polyester) sleeve. Avoid writing directly onto your prints. If you have information to include about the subject of an image, inscribe this on the space surrounding your print. Inks can bleed or gradually discolour your images. Don’t use self-adhesive albums! Reference number: 2005.001.06.01.008.2. 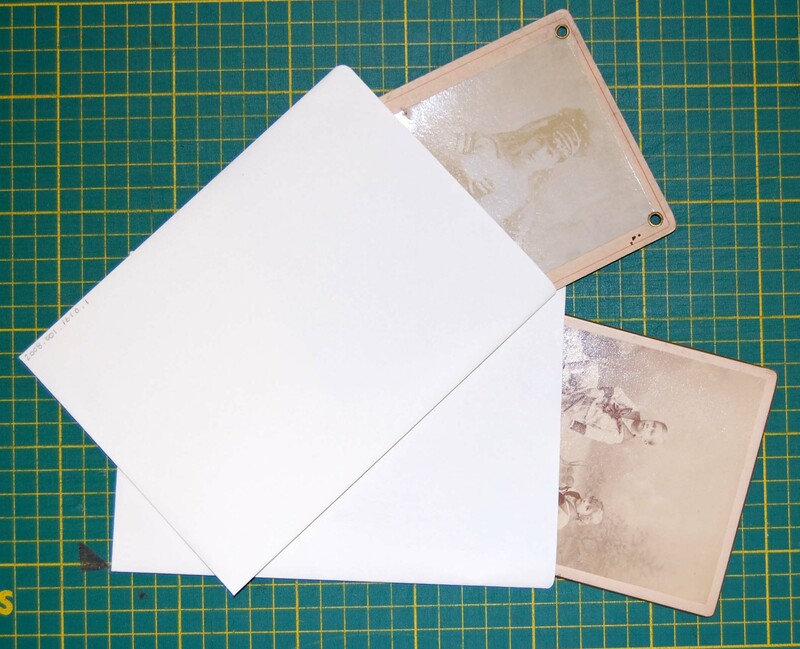 Do use photo corners, archival sleeves and tissue to protect your prints. Write descriptions on the area around the photograph, and not on the photo itself. Reference number: 2008.001.2.010. If you have negatives interfiled with your prints they can also benefit from re-housing and separate enclosures. 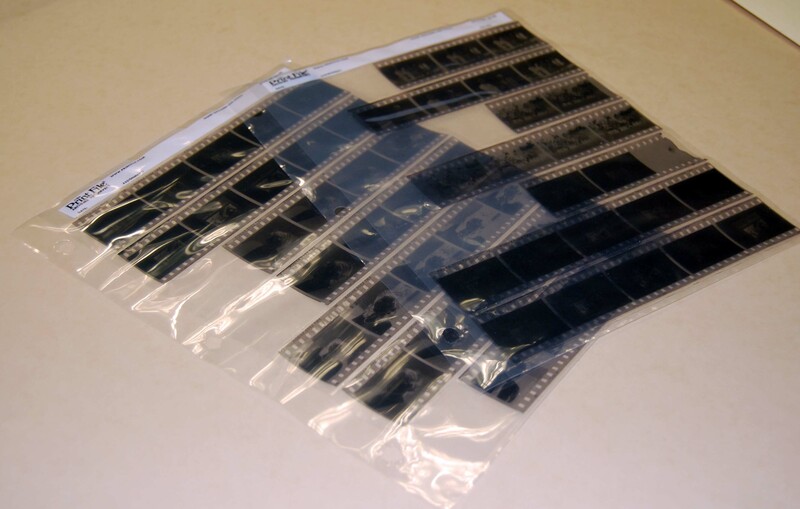 Acetate negatives in particular might be something you choose to digitize, as they are prone to vinegar syndrome, a form of deterioration that can only be delayed by freezer storage. If you have undeveloped rolls of film that you’ve been meaning to process, but haven’t got around to, sooner is better than later. 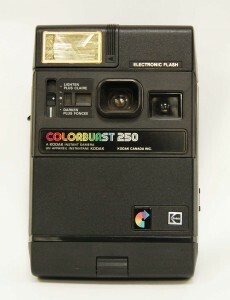 Just like your prints, film is subject to natural deterioration that may have already distorted your undeveloped images. Also, your opportunity to have someone else print them is quickly diminishing as the onset of digital takes its toll on commercial printing businesses. The trend of portraiture rapidly evolved after the birth of the medium of photography. 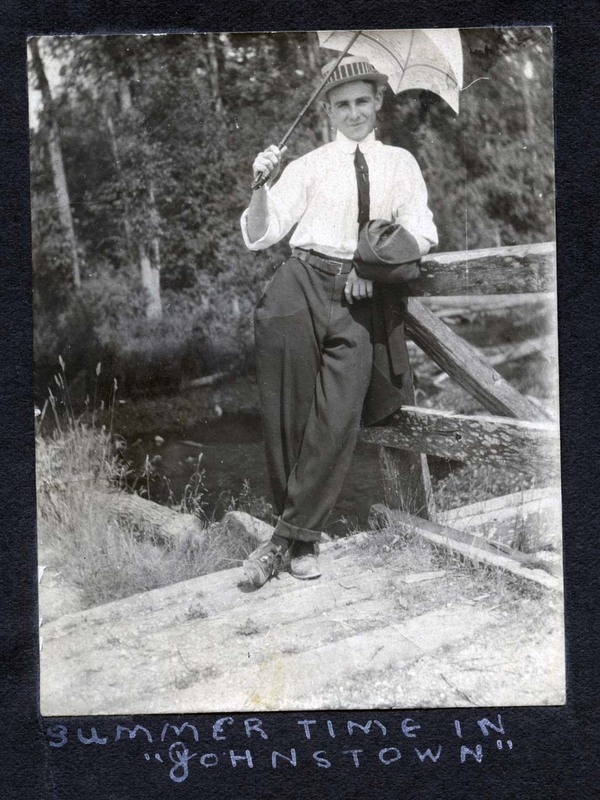 With this new and fascinating technology it became a novelty to have your photograph made and to use it as a symbol of personal identity. Through image content and format, a photograph can tell many things about its subject such as class, position, time period and personal values. With the first internal-combustion engine patented by Karl Benz in 1896, the rise of the automobile commenced and its increasing presence in photography is representative of the role it played in society during that time. Figure 1: 2008.001.221. William Lees, [Family group sitting in a studio car prop], cabinet card [between 1898 and 1914], Portobello, Scotland, 16.4 x 10.3 cm. 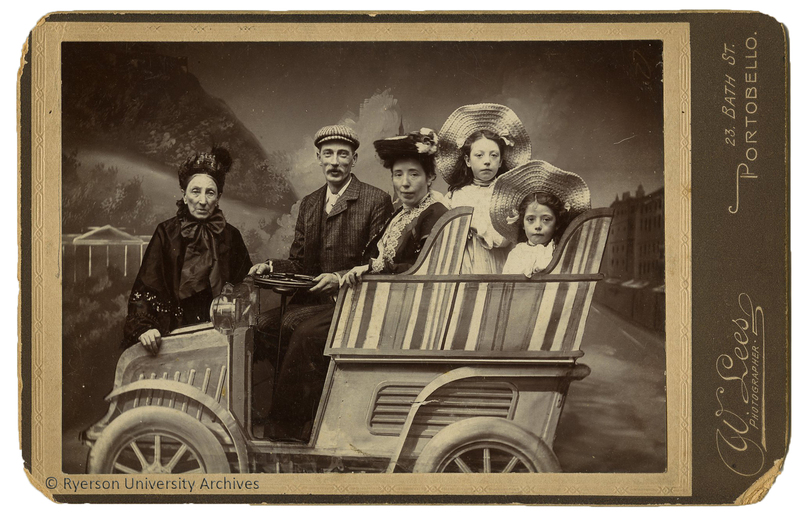 The presence of the automobile in this cabinet card (figure 1), made at a photography studio in Portobello, Scotland, suggests a general excitement for the ever increasing popularity of this new method of transportation. William Lees, a photographer known for his unique and entertaining studio backdrops, captured this family in front of a painted landscape where they are positioned around and inside of a painted studio prop car. 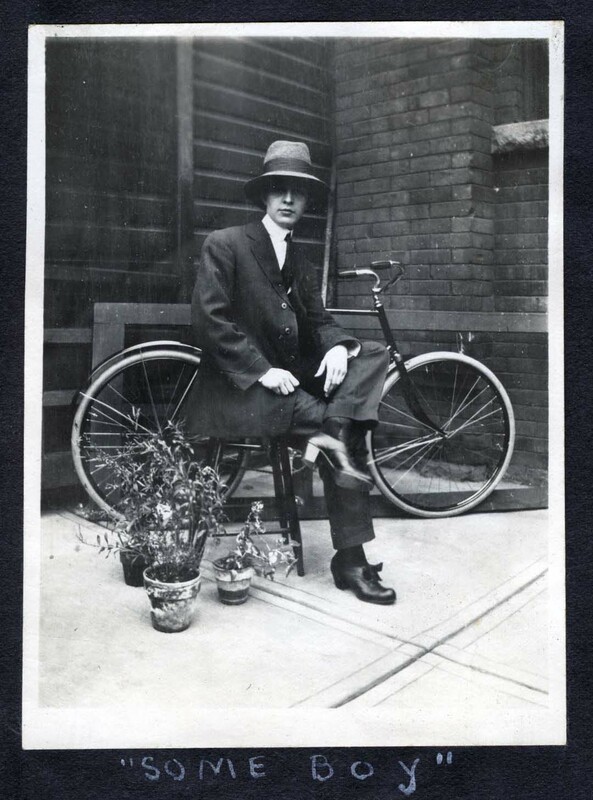 Although this may have created an image that seems somewhat comedic to modern day viewers, the inclusion of this horseless carriage, even as a painted cardboard cut-out, speaks to the values and studio practices of the time period. Regardless of the quality found in the studio backdrop and props, W. Lees was working at the request of a customer desiring to be photographed in this specific way. What would have motivated a family to want their professional portrait taken in a makeshift cardboard car placed in front of a landscape backdrop that it does not quite fit into? Through the 1890s and the first decade of the twentieth century, cars were a luxury that only the wealthy could afford to buy and maintain. [iv] They were a symbol of status and more of a plaything than a practical method of transportation. 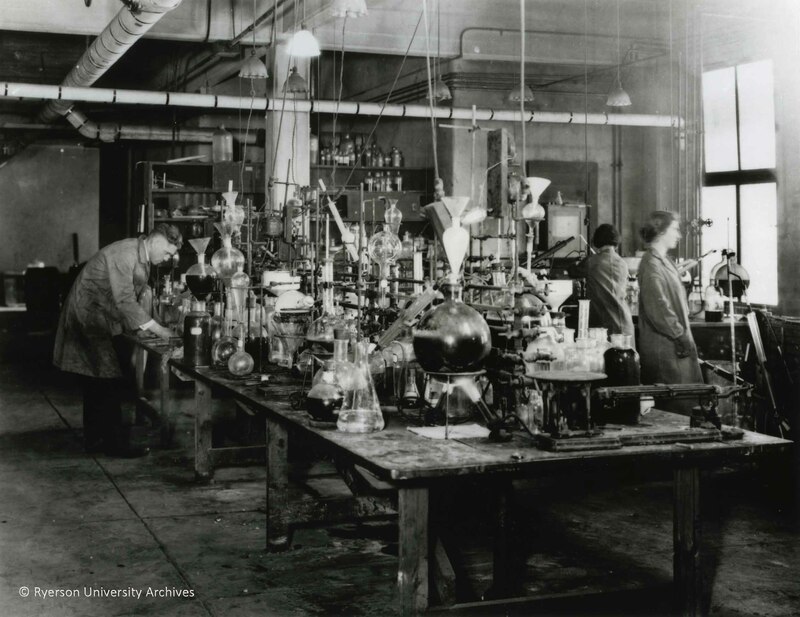 At the same time, they were new and increasingly accessible inventions that were readily gaining popularity in the U.K. throughout the late nineteenth-century. That a Scottish family such as that in figure 1 would have been eager to take part in this cultural experience, or even a makeshift version of it, is not a surprise. Figure 2: 2008.001.1821. Unknown, [Group portrait with a car], tintype [ca. 1905], 8.5 x 6.5 cm. Seen in this tintype (figure 2) is another example of a group choosing to sit within an automobile for their studio portrait. 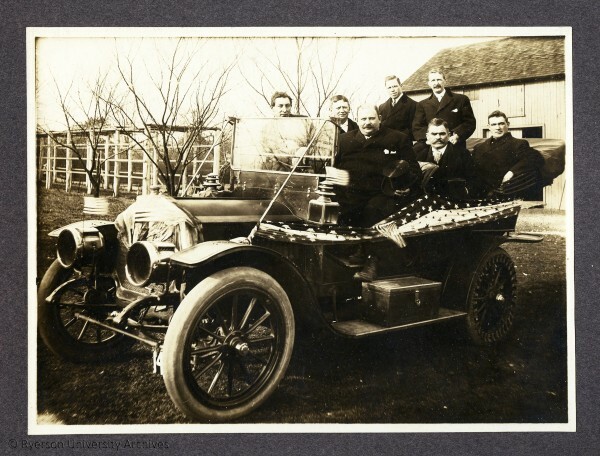 Although the photographer is unknown, the painted backdrop and presence of an actual car suggest the importance for this group to own a photograph documenting themselves within it. Generally, America had adopted the automobile by 1899, but it was still a novelty few were fortunate to own, an estimated 2500 produced in the United States that year for a population of approximately 74.5 million. [v] Perhaps the photographer was a travelling one, as many tintype studios were, and set up their backdrop outdoors allowing the inclusion of a real automobile to be a plausible option. Regardless of how it got there, its presence in this photograph makes a statement to the growing interest in this new machine. Figure 3 (above): 2009.005.026. 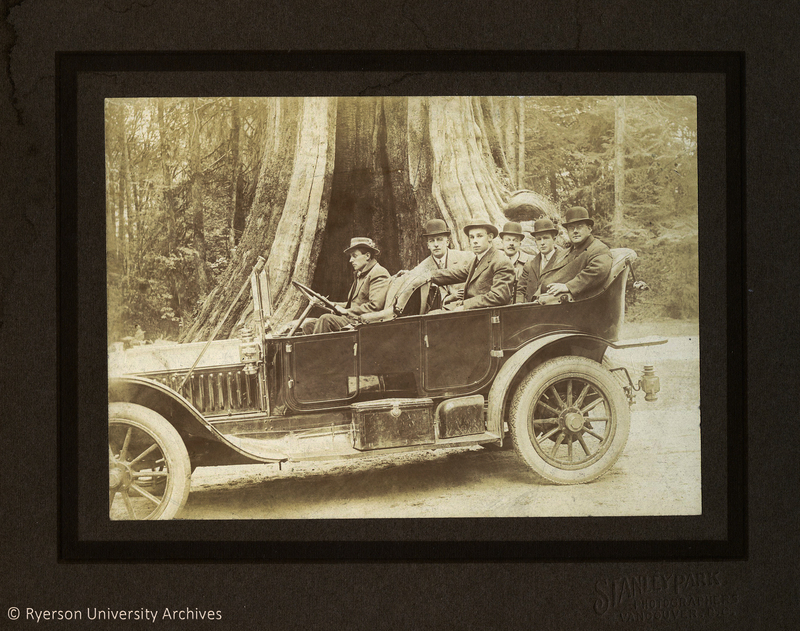 Stanley Park Photographers, [Group seated in a car in front of the Hollow Tree in Stanley Park], gelatin silver print on card mount [ca. 1910], Vancouver BC, 20.2 x 25.4 cm (with mount). Figure 4 (below): 2008.001.622. 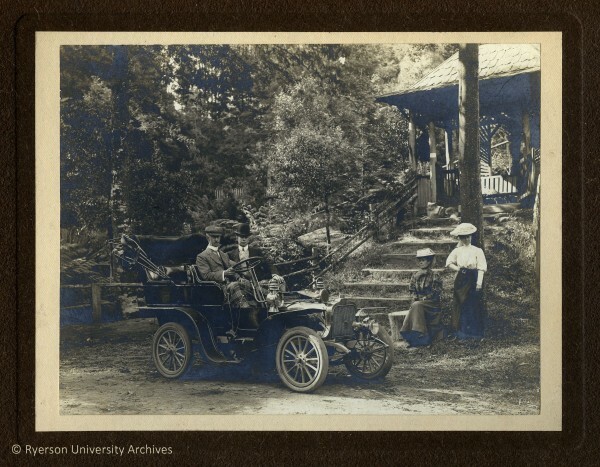 Stanley Park Photographers, [Portrait of men in car at Stanley Park], gelatin silver print on card mount [ca. 1915], Vancouver BC, 22.0 x 26.7 cm (with mount). 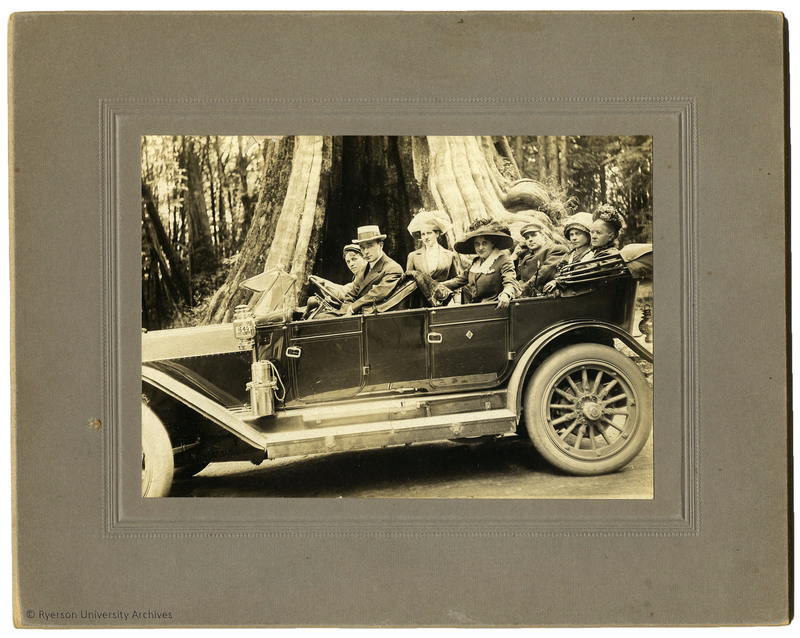 These two portraits (figures 3 and 4), taken in front of the Hollow Tree in Vancouver, B.C., illustrate the role of the automobile and photography in tourism. 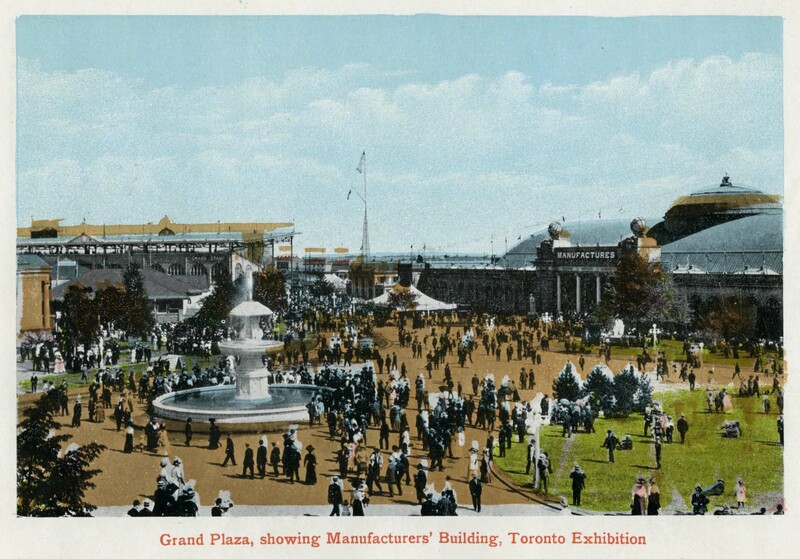 Between 1900 and 1910 considerable progress was made in North American automobile production and automobiles were surpassing speeds of 25 kilometers per hour. Owning an automobile provided not only an opportunity to show off your wealth, but also an efficient way to travel through the countryside. No longer requiring the long set-up of horse and carriage, groups and families could spontaneously decide to take their car out to see sites and landmarks such as the Stanley Park Hollow Tree. [vi] Here we see the results of when these lucky travellers were met with a strategically placed camera in front of the Western Red Cedar tree, where a photographer was ready to snap a picture and document their visit. Figure 5: 2008.001.1471. 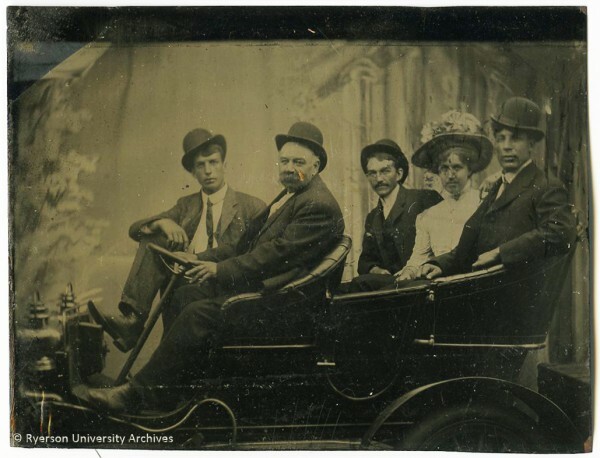 Unknown, [Men in car], gelatin silver print on card mount [ca. 1910], United States, 25.5 x 30.6 cm (with mount). As the introduction of the Kodak Brownie camera in 1900 provided the masses with an easy and inexpensive method of making their own snapshot pictures, professional photographers also found an increased mobility in their practice. Moving towards the 1920s, the increasing commonplace of photography was mirrored by that of the automobile, increasing the likelihood of seeing a car parked in front of your neighbour’s house. 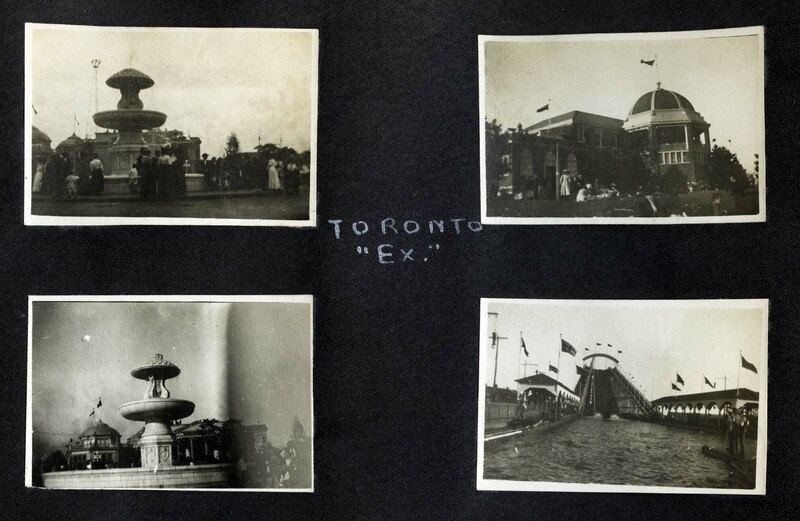 Combined, the presence of cars in photographs became more frequent and less formal. 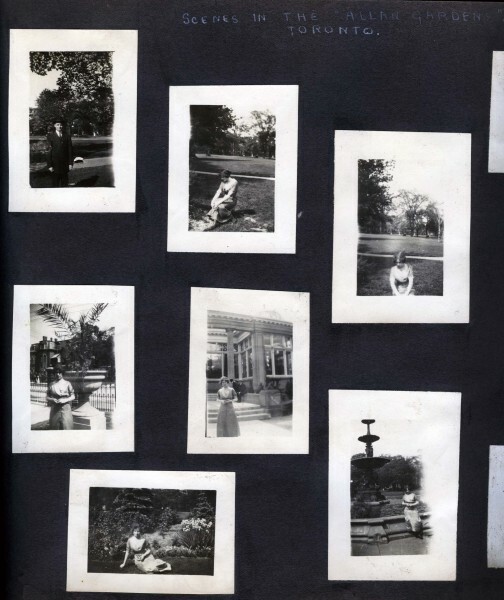 Groups and individuals were photographed in their cars at events, at their homes and anywhere else their car could take them (figures 5 and 6). Figure 6: 2008.001.1482.2. Unknown, [Portrait of two men in a car], gelatin silver print on card mount [ca. 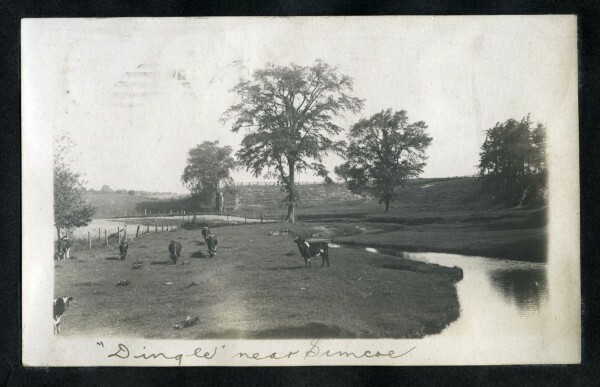 1905], 24.8 x 30.5 cm (with mount). 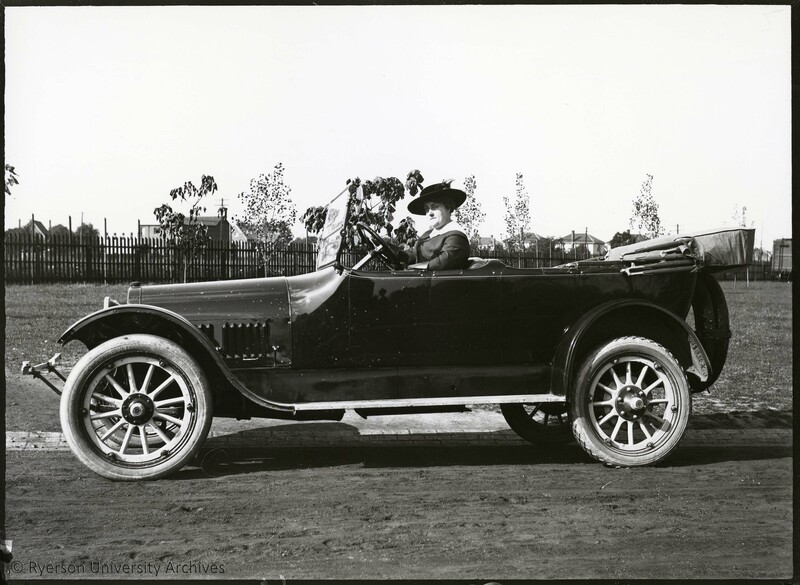 The phenomenon of including an automobile within portrait photographs is not restricted to the early twentieth century. Cars, trucks, vans, motorcycles, RVs and ATVs are still among our most expensive and prized possessions and it is not unusual to desire a picture taken of ourselves with it. However, as technology changes, so too does the appearance of the vehicle we are sitting in (or standing beside), the ease at which we can acquire such an image, and the format in which we capture and display it. Figure 7: 2005.001.06.03.006. 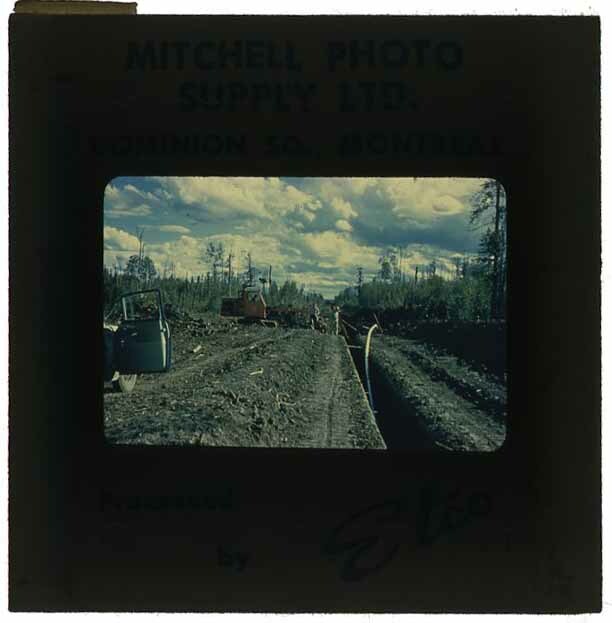 Unknown, Kodak Canada Inc., [Vehicles], gelatin silver print [ca. 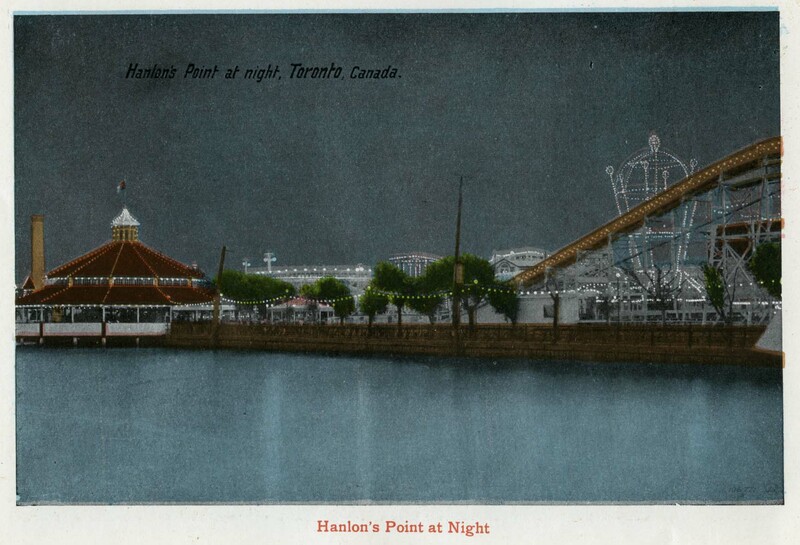 1910], Toronto ON, 20.32 x 25.4 cm. 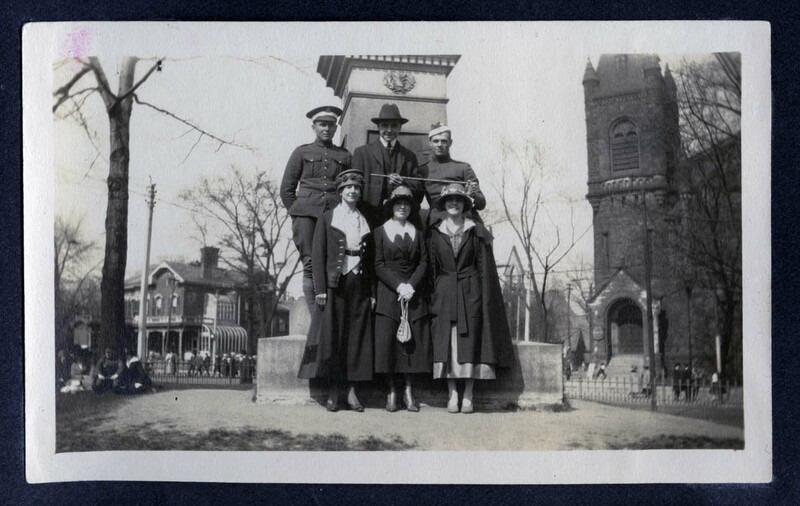 If you have any additional information about these photographs or the automobiles in them, we would love to hear from you! 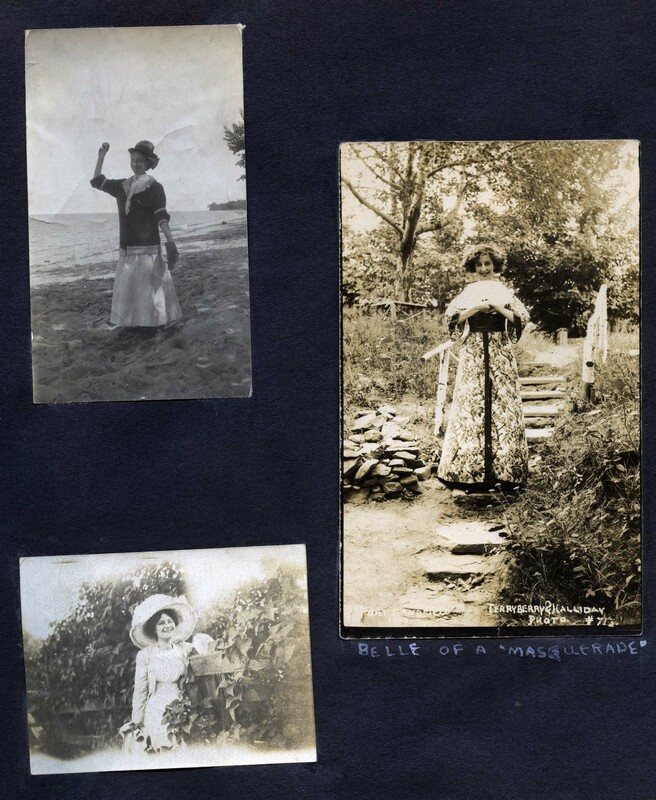 [i] W. Whitehead, “Home-made Backgrounds,” The Photo-American, Vol. 3, no. 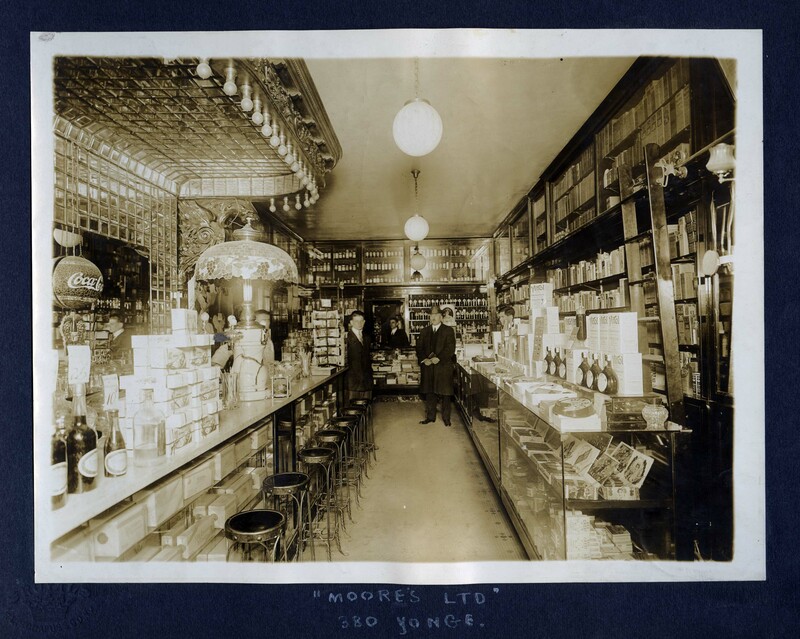 3 (January 1892): 70. [ii] Henry Peach Robinson, Pictorial Effect in Photography Being Hints on Composition and Chiaroscuro for Photographers, (1869. Reprint, Pawlet, Vermont: Helios, 1971): 102. [iv] John Heitmann, The Automobile and American Life, (Jefferson, North Carolina: McFarland & Company, Inc., Publishers, 2009): 10. [v] James J. Flink, America Adopts the Automobile, 1895-1910, (Cambridge, Massachusetts: The MIT Press, 1970): 29. [vi] George S. May, A Most Unique Machine: The Michigan Origins of the American Automobile Industry, (Grand Rapids, Michigan: William B. Eerdmans Publishing Company, 1975): 42-45. Flink, James J. America Adopts the Automobile, 1895-1910. Cambridge, Massachusetts: The MIT Press, 1970. Heitmann, John. The Automobile and American Life. Jefferson, North Carolina: McFarland & Company, Inc., Publishers, 2009. May, George S. A Most Unique Machine: The Michigan Origins of the American Automobile Industry. Grand Rapids, Michigan: William B. Eerdmans Publishing Company, 1975. Neal, Avon. 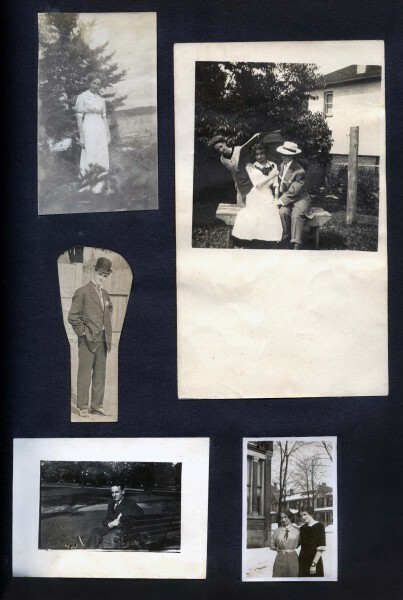 “Folk Art Fantasies: Photographers’ Backdrops.” Afterimage. Vol. 24, issue 5 (March/April 1997): 1-13. Academic Search Premier, EBSCOhost (9703172176). Roberts, Peter. A Pictorial History of the Automobile. New York: Grosset & Dunlap, 1977. Robinson, Henry Peach. Pictorial Effect in Photography Being Hints on Composition and Chiaroscuro for Photographers. 1869. Reprint, Pawlet, Vermont: Helios, 1971. Thomas, Alan. 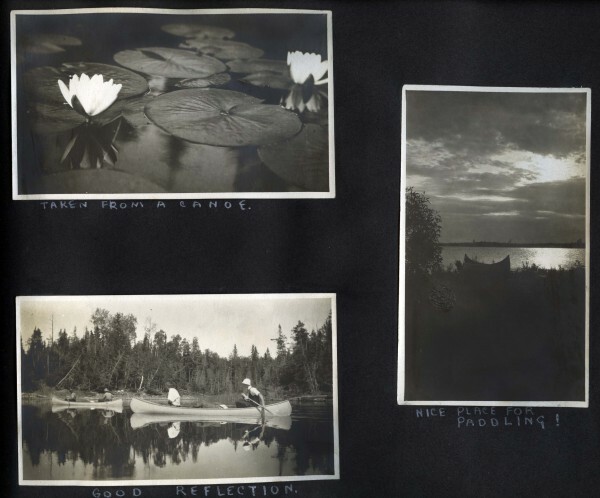 The Expanding Eye: Photography and the Nineteenth-Century Mind. London: Croom Helm Ltd., 1978. The Studio. Edited by Jerry Korn. New York: Time-Life Books, 1971. Vogel, Dr. Hermann. “Filling the Picture. 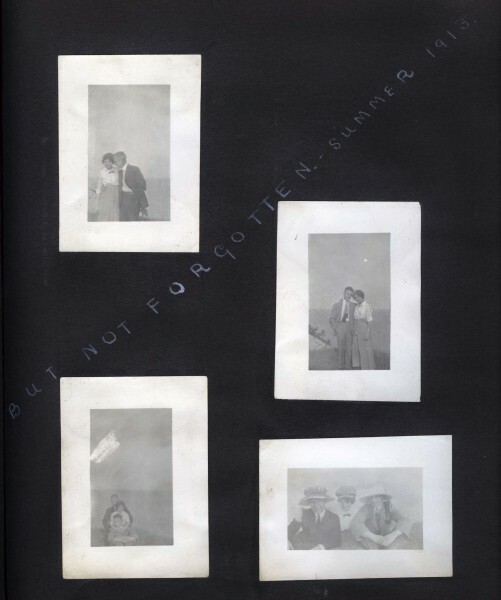 Accessories and Backgrounds.” Handbook of the Practice and Art of Photography. 2nd ed. Translated by unknown. Philidelphia: Benerman & Wilson, 1875. Whitehead, W. “Home-made Backgrounds.” The Photo-American. Vol. 3, no. 3 (January 1892). Wilson, Edward L. “Lesson K. Accessories and Light.” Wilson’s Photographics: A Series of Lessons, Accompanied by Notes, On All the Processes Which are Needful in the Art of Photography. New York: Edward L. Wilson, 1881. Living in an image saturated world, it is easy to forget that photography is still a relatively new invention. Less than two hundred years ago, people saw extremely detailed and realistic images of the world captured in a permanent photograph for the first time. Needless to say, the invention of our favourite past-time, the motion picture, is even newer still. 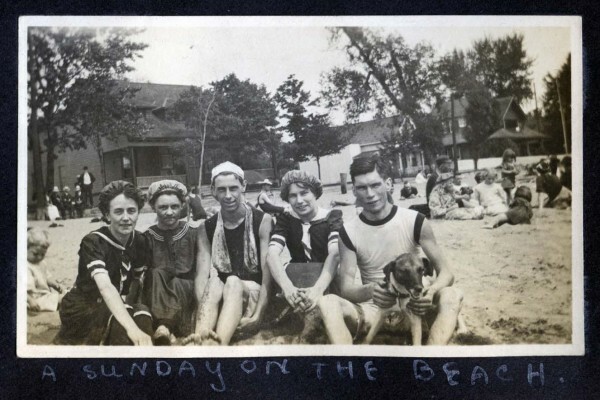 It is human nature to seek entertainment, yet we rarely consider what our great-great grandparents did for leisure. 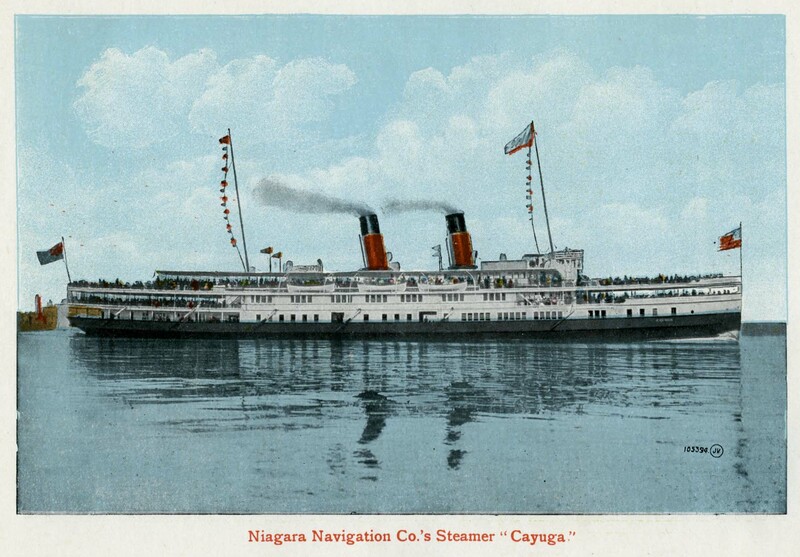 There has always been a desire to learn and discover new parts of the world, but long-distance travel was much less feasible during the 1800s, thus substitutes were made in a variety of forms of amusement. Before film and television, at a time that was full of innovation and creativity, there existed a number of forgotten optical spectacles involving the use of light and movement that have since disappeared from our generation. The magic lantern existed in many different formats for thousands of years and was based on the idea of projecting images with light onto a wall or surface. 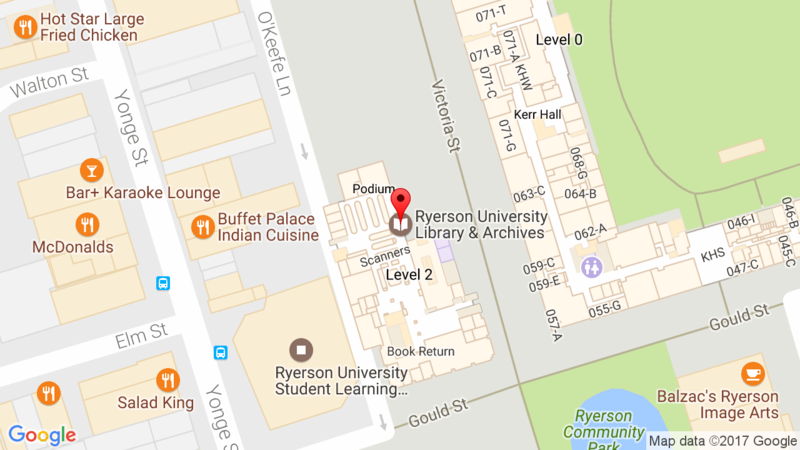 In fact, this idea is still one that is in popular demand, most familiarly with the projectors that are used for PowerPoint and other presentations in many classes here at Ryerson. However, this is by no means a new idea. The fascination with projection dates back to drawings made by Da Vinci that look similar to a Bull’s Eye lantern. First described in 1646 by Anthanasius Kircher, a German scholar, for use in science and philosophy, the magic lantern was quick to become a form of public entertainment. 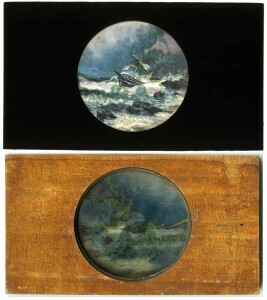 A reflective and transparent image of a hand-painted lantern slide with a circular image, circa 1890. 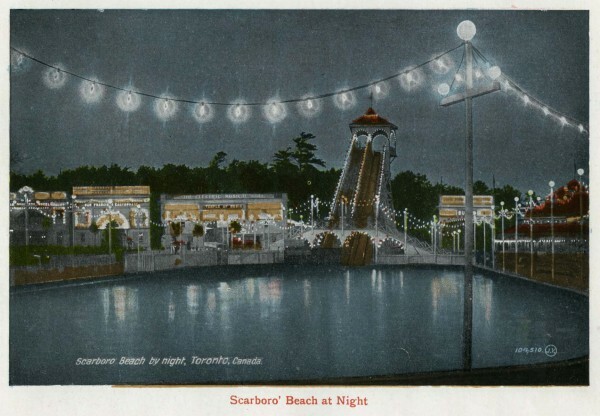 Although first limited to small audiences because of the strength of its illuminants, throughout the nineteenth century significant improvements were made to the technology, such as advances in lenses, illuminants and the use of mirrors that allowed for bigger, indoor shows and more fanciful and detailed slides. Magic lanterns were eagerly adopted as a form of entertainment and were used for shadow puppet shows, to illuminate engravings and create apparitions, and with hand-painted and photographic slides. 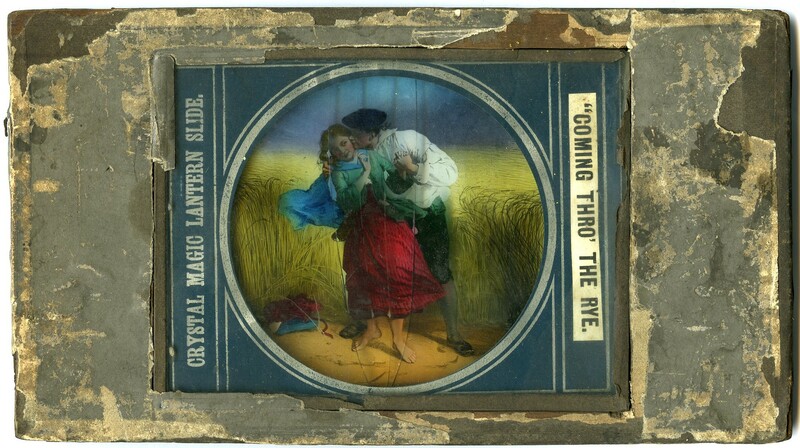 Hand-painted lantern slide circa 1890 illustrating the 1782 poem, “Comin’ Thro’ the Rye” by Robert Burns. Especially during the nineteen hundreds, new types of magic lanterns began to appear. 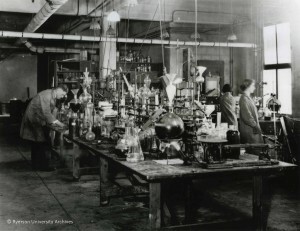 There were projecting microscopes, which were used in the field of biology, and magic lanterns that were used in pairs or sets of 3 that, with the aid of a fan-like device, were capable of creating dissolving views and other special effects. With the advent of photography and cinema, magic lanterns began to appear on the mass market under numerous names in a variety of formats. 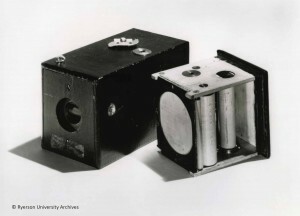 The Lumière Brothers used the technology for their first film screening in 1895. 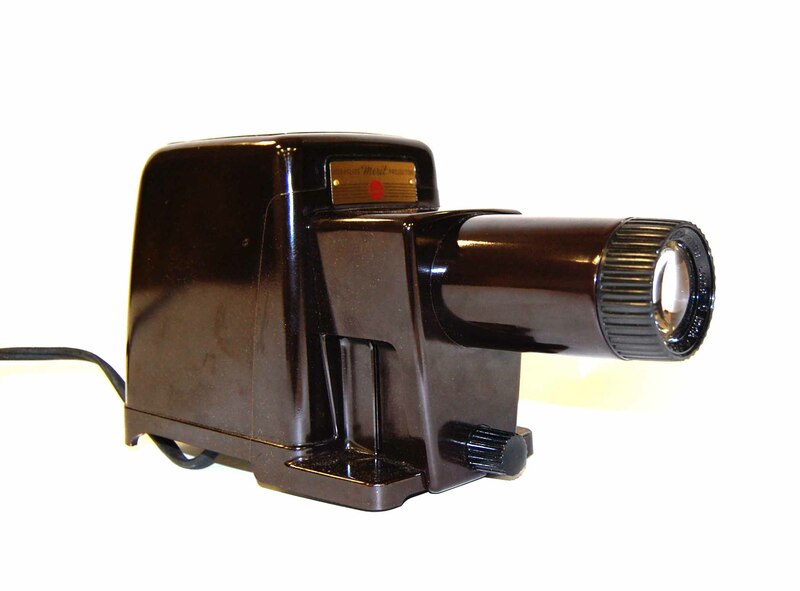 The 1950s saw the opto-mechanical advancements that began the popular trend of the slide projector, which was often used as a form of entertainment to show photographs to family and friends. A motion picture projector circa 1950. The idea behind them all was the same and they were actively used to tell stories, to educate, and to show audiences views of faraway places. 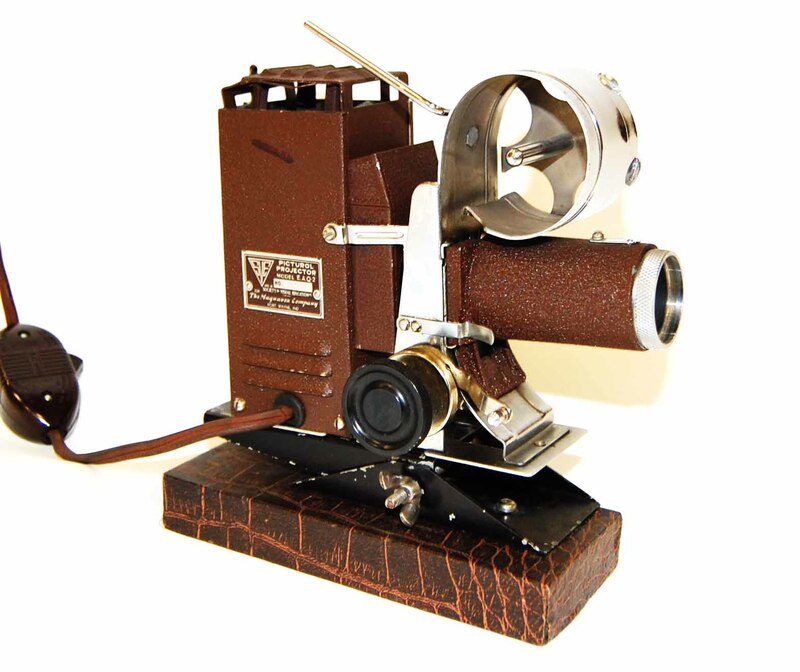 Here in Special Collections we have a number of more recent examples of both slide and motion picture projectors, as well as photographic and hand-painted slides in a variety of formats. More about magic lanterns can be found on The Magic Lantern Society webpage. Today when we hear the word “panorama” a 180 to 360-degree photograph is likely what comes to mind. 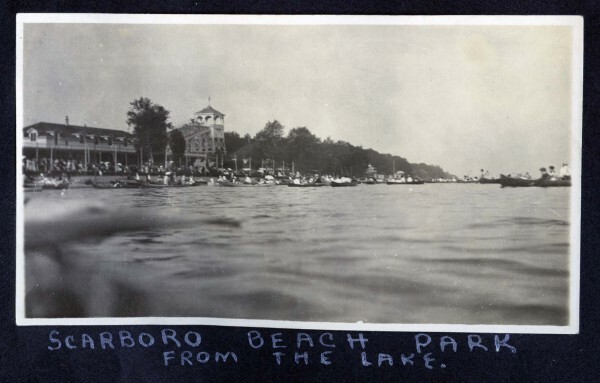 However, the first patent for a panorama was issued in 1787 to Robert Barker, over 50 years before the invention of photography around 1839. 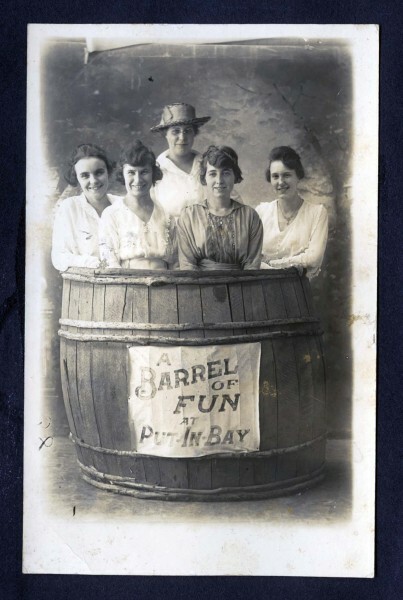 It was one of the most popular forms of entertainment during the nineteenth century, yet something we rarely hear about today. Translated from Greek, the term panorama means ‘see all’ and that is exactly what they aimed to do. To really understand what the term panorama meant during the late 18th and 19th centuries, try to imagine walking through a dark corridor into a large, circular, naturally lit room in which, constructed from floor to ceiling, is a continuous representation of a distant land, a battle scene, or an escape from the industrializing city landscape that completely surrounds you. The painting has been made to appear as realistic as possible: the top edge has been masked by a veil or roof, and the bottom edge is concealed by a fence which you can walk up to. The average size of a panorama was 15 by 20 metres and took an immense amount of teamwork to build, but the results always attracted a crowd. Hand-painted lantern slide. Panoramic slides such as this could be moved through a magic lantern to create a moving panorama type of effect. 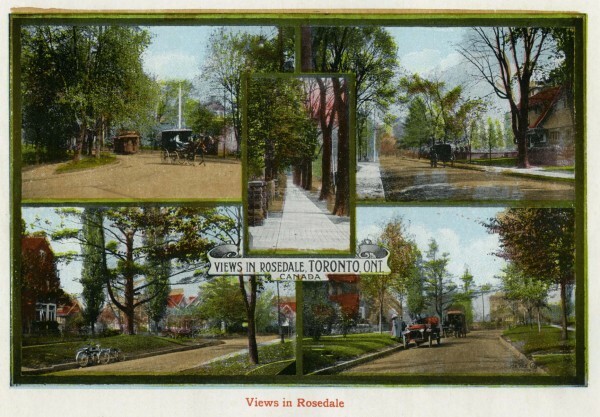 As the popularity of the panorama took off in the late 1700s and early 1800s, the term began to take on other meanings, and new formats of the medium began to be created. Any sort of large or oversized painting began to be considered a ‘panorama’ as well as huge paintings that would only cover a semi-circle rather than 360-degrees. Another popular format of the panorama was the moving panorama. 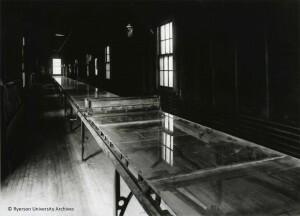 Spectators of the moving panorama were seated in an auditorium and instead of being surrounded by the panorama a long roll painting was moved across a window, often set up with curtains similar to a typical theatre stage. A mechanical cranking system was used to pull the painting across the audience’s view. Often, music, lecturers or sound and light effects would accompany the presentation of the work. Unlike the circular panorama, the moving panorama used a transportable format that could tour to new cities and towns, saving on the costly operation of construction and making it more accessible. The panorama, in any sense of the word, was truly a spectacle that gave viewers a chance to experience the world without having to travel far from home, some of which still exist and can be viewed today. 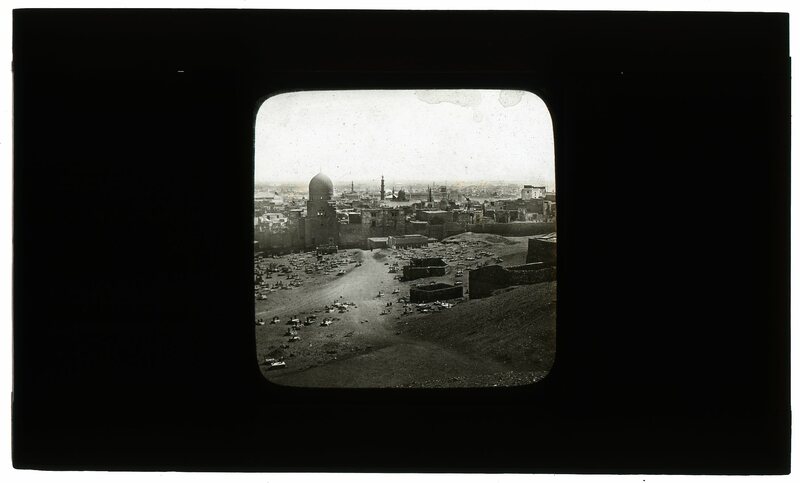 Black and white glass lantern slide in a wooden frame circa the 1890s. Handwritten on the frame is “Panorama of Cairo” suggesting the use of magic lanterns to create panorama-like effects. If you have taken a photography course at Ryerson, it is likely you have heard of L.J.M. Daguerre and his infamous diorama. 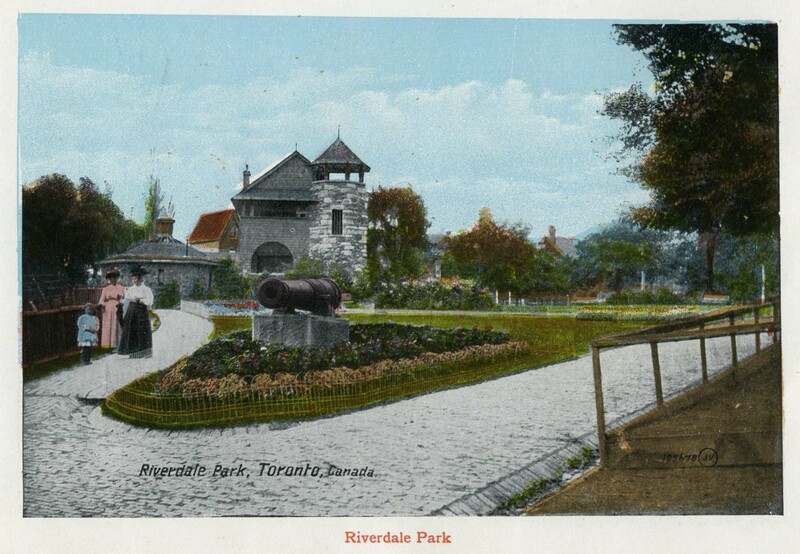 The diorama often competed with the panorama and used a combination of ideas from both the panorama and the magic lantern to create a theatrical experience for the audience. 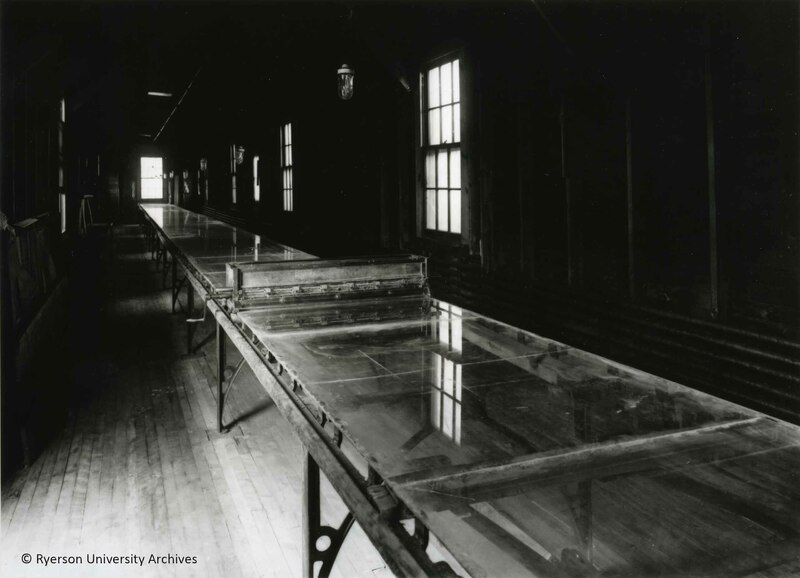 The diorama consisted of an exhibition of enormous transparent paintings under changing lighting effects. With these effects, audiences could witness changes in mood and scenery, such as the weather. The illusions immediately got attention for their ability to transform paintings into three-dimensional renderings that many claimed could not be distinguished from large-scale models that used real objects. Similar to the panorama, the viewer was walked through a dark hallway into an auditorium that could hold close to 350 people, where they were kept stationary with the illuminations revolving slowly around them, only visible through screen tunnels that created depth and hid the edges of the paintings. The pictures measured close to 22 metres wide by 14 metres high and were situated 13 metres back from the front row. The viewer was kept in very dim lighting until the start of the show when the curtain was drawn up and the image was revealed. Effects were rendered through use of transparent and opaque painting techniques and coloured screens that altered the daylight passing through the back of the picture. A more modern colour slide from the 1960s. Kodaslide Merit Film Projector. Manufactured from 1951 to 1956. Balzer, Richard. Optical Amusements: Magic Lanterns and Other Transforming Images – A Catalog of Popular Entertainments. Watertown, MA: Richard Balzer, 1987. 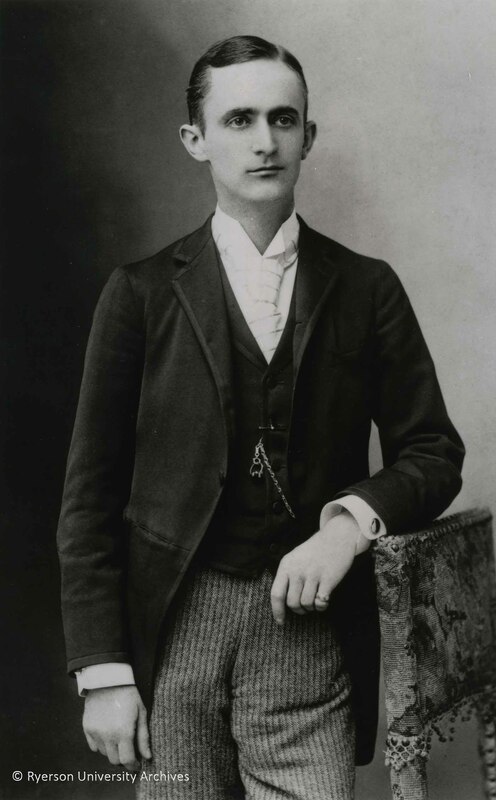 Chadwick, W.J. The Magic Lantern Manual. London: Frederick Warne & Co., 1878. Comment, Bernard. The Panorama. Translated by Anne-Marie Glasheen. London: Reaktion Books, 1999. Daguerre, Louis Jacques Mandé. An Historical and Descriptive Account of the Various Processes of the Daguerreotype and the Diorama. Paris: Béthune et plon, 1839. Reprinted with illustrations and an introduction by Beaumont Newhall. New York: Winter House, 1971. Greenacre, Derek. Magic Lanterns. Princes Risborough, Bucks, England: Shire, 1986. Huhtamo, Erkki. 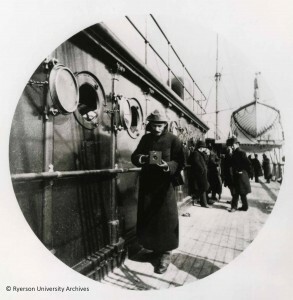 Illusions in Motion: Media Archeology of the Moving Panorama and Related Spectacles. Cambridge, MA: MIT Press, 2013.